The SYSPRO-AHD2BX is an HD surveillance system that includes 2 HD CCTV security box cameras, a hybrid HD surveillance DVR, pre-made video / power cables, and power supplies. 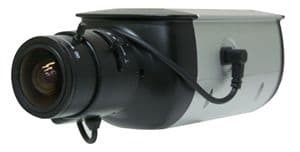 The AHD-BX3-28 cameras that are included with this system are for indoor use, however they can be used in outdoor applications with the optional housing upgrade. The 2.8 to 12mm varifocal lens of the camera lets installers adjust the angle of view from very wide angle of view (approximately 108 degrees) to a more zoomed in view. This camera does not include infrared, but does feature a black & white lux rating of 0.1 for low light environments. This is an excellent high definition system for home, business, and government installation.